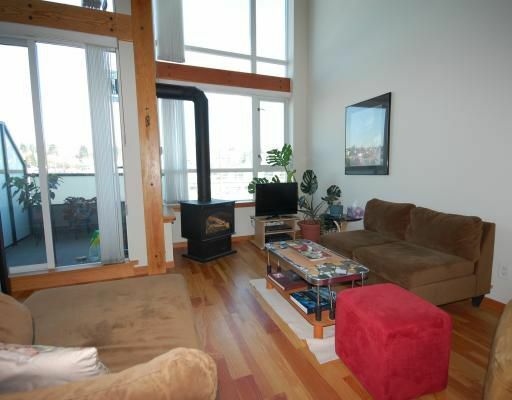 Spacious & airy 2 level loft @ Murano, located at the Quay! Offering vast 17' high ceilings & dramatic double height windows. Living, dining & powder bathroom on the main. Sleeping & work space up in the loft. The loft is spacious enough to fit a king & offers a large walk in closet, laundry & full ensuite bathroom. High end open kitchen offers tons of counter & cupboard space. There is a 5 burner gas stove & stainless steel appliances. The finishes are excellent throughout this home with granite counters in the kitchen & bathrooms, fir plank floors & handset slate tiles. Cozy gas fireplace in the living room & an airy balcony to take in fresh air. Open & private views of the city! One secured parking & in-suite storage. Great location that is steps to the boardwalk, dog park & transit! Walk or jog along the river & get your fresh produce at the public market. CALL NOW & ELEVATE YOUR LIFESTYLE!